A hint of good news from a new supply contract was just a drop in the bucket compared with the overall market swoon. 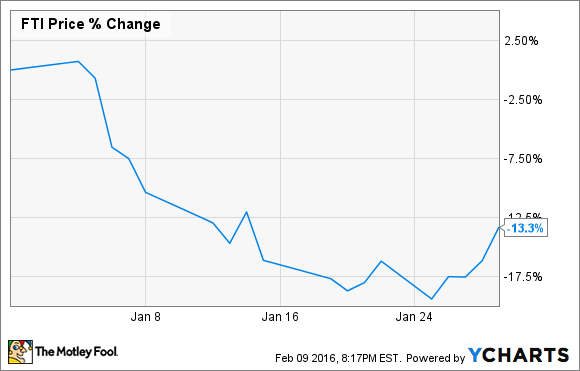 What: Shares of FMC Technologies (NYSE:FTI) declined 13% in January. Even though the company signed a decent-sized contract during the month; overall energy stock malaise dragged its share price down. So what: There haven't been a whole lot of reasons for oil services companies to celebrate as of late, but last month FMC Technologies had a little good news to announce when it said it had secured a $180 million contract to manufacture and supply Australian company Woodside Petroleum with subsea production systems. Granted, it's not a needle-moving kind of contract for a company that was doing more than $2 billion in quarterly revenue as recently as a year ago, but right about now companies in the space will take any sort of good news. What wasn't working in the company's favor was last month was that oil and gas producer budgets for 2016 will likely be even lower than last years cuts. As capital budgets dry up, contracts like these are going to become fewer and farther in-between. FMC Technologies has a little bit of a cushion here because most of the equipment it sells are for pre-sanctioned projects that are under development. So the decline hasn't hit the company as hard as those companies that are more oriented toward the exploration side of things. Now what: FMC Technologies has weathered the storm of low oil prices relatively well over the past year. The company remains profitable, generates free cash flow, and long-term debt minus cash is a modest $500 million. It may take a while before FMC Technologies sees a turnaround in revenue, but the company remains in decent shape 18 months into this down market. With shares trading down 64% from their highs back in 2014, taking a second look at FMC's shares while the market remains low might be a good idea.